Have you seen the blog header that I make on Christmas time? These days I have done crochet stars, yes, for Christmas decoration. to make them more colorful and alive. Do you like the result? with crochet but I have made some crochet stars. And it has been fun, yeeeeeees! There are thousands of possibilities, right? I will soon to show you the final result! You still not have made ​​Christmas decorations? you should try it, it's easy and great satisfaction for you and your home! Your stars are great! I think I must make a few too. Really cute!!! 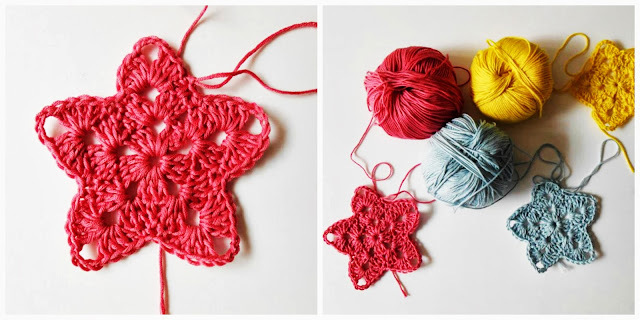 I'll try to knitt one of these lovely stars! La capçalera genial!!! Les estrelles perfectes!!! Les tinc pendents de fer!!! Però molt em sembla que per l'any que ve!!! Oooh m'encantaaaaaa!!! Quina monada d'estrelletes Cristina... Són molt dolcetes, aquestes llanes de DMC són genials oi!? Molt xules estrelletes. M'agraden. Gràcies per compartir. Aquest fil té pinta de ser molt còmode per treballar, molt boniques! Cristina, m'encanten aquestes estrelletes !!! I la capçalera queda moníssima!!! Unes fotos super xules!!! Un petonas maca!!! These are lovely and I'll definitely be back to read your blog.